Although this CD was released in 2012, it has only just emerged from an embarrassing pile of CDs, still in their wrappers, that I found in one of my rare tidy-ups. I have missed four years of listening to some outstanding playing from Susanne Heinrich. As her own very personal programme note explains, this is something of a labour of love. A youthful player of the violin, Susanne Heinrich attempted the Bach solo violin works, but never with much success. Her viola da gamba playing was already beginning to take over from the violin, and she lamented the fact that Bach left so little music for the viol. But the draw towards his solo violin works never left her, leading to a much later attempt to play them on the gamba – very far from an easy thing to do. That led to a considerable amount of work in trying to work out how they could be played successfully on the gamba, raising questions as to pitch, tunings, articulation, and the extent to which the violinistic mood should be amended to suit the sonority and colour of the viol, and, not least, the technical difficulties of actually playing the music. As Heinrich writes, ‘playing this music on the bass viol is so difficult, it is unlikely to start a trend’. The result, as evidenced by this recording, is a triumph. Listening to this recording, it is difficult not to believe that this is Bach writing specifically for the gamba, such is the success of these transcriptions. And transcriptions they are, rather than arrangements. Playing from a copy of the original manuscript, Heinrich makes only tiny and subtle changes to the score, the major one being to transcribe the E major Partia down to D major. 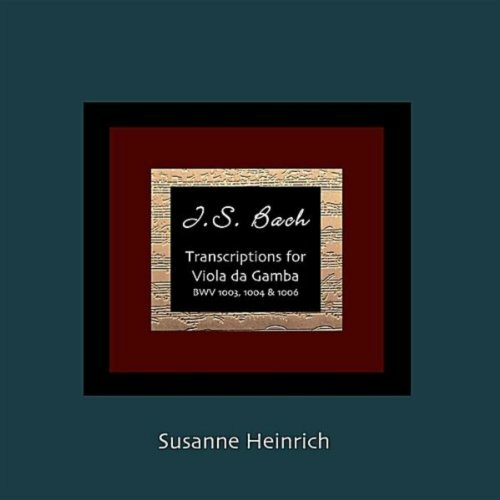 As well as emphasising the obvious benefits of the sonority of the gamba, with its sensitivity of timbre and slightly ethereal sound, Susanne Heinrich also brings to the music an exquisite sense of musical thought and rhetoric, beautifully delineating the little motifs that Bach uses to energise his music lines. The concluding Ciaccona from the 2nd Partia is one of the finest interpretations I have heard, on any instrument. You can find details and purchasing options here.